Haydn’s autograph manuscript of the Scena di Berenice contains several hand-written changes which were made at some point after 1797, probably for a concert which took place in Vienna’s Augarten on 22 September 1803. The most significant of these changes is that he cut the opening three bars, possibly because he feared that their soft dynamic might lack the impact to attract an outdoor audience’s immediate attention. For this recording we have put these opening bars on a separate track, to enable the listener to choose either version. It was with the intention of studying with Mozart that Ludwig van Beethoven (1770-1827) first came to Vienna in April 1787. In the event his visit was soon cut short when he was called to return to his dying mother in Bonn, and there is no absolute proof that the two men ever met; by the time Beethoven returned to Vienna five years later—this time for good—Mozart was dead. Although he had already composed some impressive and distinctive works, including the Cantata on the Death of Emperor Joseph II, Beethoven clearly still felt the need for further study, and he continued to have lessons throughout his first decade in Vienna, voraciously plugging the gaps in his musical education. These lessons focused on two main areas—initially with Haydn and subsequently with Johann Georg Albrechtsberger he studied strict counterpoint, and with the court Kapellmeister Antonio Salieri he studied Italian prosody and vocal composition. All three teachers seem to have had a similar impression of the young firebrand, for several years later Beethoven’s own pupil, Ferdinand Ries, was to recall how “they all said that Beethoven was so headstrong and wilful that he often had to learn through bitter experience what he had refused to accept when it was presented to him during the course of his lessons”. Lessons with Salieri were probably quite sporadic; in his later years Salieri set aside three mornings a week to give free tuition to talented young composers and singers, and Beethoven continued to take advantage of this generosity at a surprisingly late stage in his development. We know this from the aria No, non turbati, which was composed under Salieri’s supervision between 1801 and 1802, by which time Beethoven had already composed many important works, including his first symphony, the first two piano concertos, Die Geschöpfe des Prometheus and indeed the concert aria Ah! Perfido. The autograph manuscript even contains Salieri’s corrections, although in truth not all of his changes are improvements (for this recording we have in several instances retained Beethoven’s original). The work is scored for soprano and strings, and the text is taken from Metastasio’s La tempesta. In the opening accompanied recitative Beethoven seizes the various opportunities to evoke in his orchestral writing the thunderstorm that is brewing, and this is carried through into the aria, marked ‘andante agitato’, in which the poet, having persuaded his beloved Nice to take shelter with him in a nearby cave, seeks to pursue his amorous ambitions. Following Mozart’s Ah, lo previdi (1777) and Bella mia fiamma (1788), the third great concert aria written for Josefa Dušek was composed by the young Beethoven in 1796. Early that year he embarked on a tour to Prague and Berlin (with stops at Dresden and Leipzig) which was intended to last for six weeks but in the event took six months. He composed Ah! Perfido in Prague, and although it was dedicated to the local patron and music-lover Countess Josephine de Clary it was first performed—in Leipzig on 21 November 1796—by Josefa Dušek, and it was surely for Dušek, herself a native of Prague, that Beethoven conceived the work. Beethoven’s compositional studies with Haydn during 1793 may have proved singularly unsuccessful—the demanding student had felt (evidently with some justification) that his teacher was not providing the rigid discipline and attention to detail that he craved, and the composer and teacher Johann Baptist Schenk subsequently claimed that during this period Beethoven had started taking extra lessons with him behind Haydn’s back—but he was still able to learn a great deal from Haydn’s compositions. 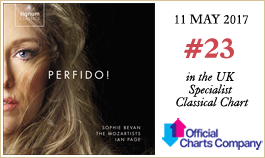 Haydn had written his Scena di Berenice in London the year before Beethoven wrote Ah! Perfido, and he had brought the score back with him when he returned to Vienna. Ah! 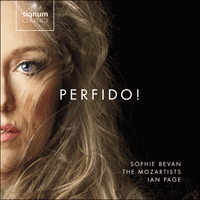 Perfido is modelled on a very similar structure and harmonic design; like Haydn’s work it is a lengthy and highly charged dramatic monologue delivered by a distraught lover, and the music has an exquisitely poised nobility of utterance. The text for the opening recitative is again by Metastasio, this time from a widely admired soliloquy in Achille in Sciro; the source and authorship of the ensuing text, however, has not been identified, and it was possibly created specifically for Beethoven’s composition. The work was not published until 1805, hence its misleadingly high opus number.